You guys are all abuzz about a regional race in a conference where a good driver in a T4 mustang could have finished second at the fastest track around (Fontana) during a Majors weekend. This class has problems, but it isn't the SMG cars... Just pray that Phoenix doesn't decide to run AS with the kid..
DHRMX5 I feel like all you are trying to do is stir up trouble. Not in the least. I would like to see this class survive but it isn't going to in it's current format. The sooner the class realizes it the better off it will be. You are throwing a lot of insults around. What do you know about this class really and who are you? Maybe you would be more credible if you were not hiding. 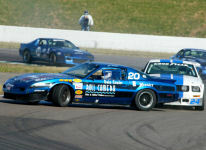 The situation at VIR this past weekend was by no means an ideal situation. There were many incredible challenges for all race groups since they were so large. All races both days had at least one FCY and often more. The T2 car you mention is NOT legal in AS. It has 18X10 wheels and 14 inch brakes for starters. The driver is yes, amazing and deserves lots of respect, which we give him. The challenges in the Big Bore group were enormous in terms of trying to get a good lap time from the practice day through Sunday's race. Our experience (we had a brake failure on the pace lap of Sunday's DRY green track race), in all sessions was that any time you tried to get a flyer lap going, it was filled with cars in the way because of the high variability in the car capabilities and the number of cars, something we have not seen any where else at that level. The current lap record at VIR in AS is a 2:04, FWIW, and it was set last year, at the Majors. Hopefully, conditions will be better for the Runoffs, but, they may not be. The entire weekend, every session was completely different due to the constantly changing weather, so AS (in Group 4) never saw the same track as T2 (Group 9) any day, so any comparisons like the one you have made are really not valid. It's just as important for people joining us in AS, who we constantly welcome, to learn a lot about the community and find out who we are, as it is for the AS community to think about the future. We welcome all positive ideas, but, criticizing makes it a challenge for your learning and for your welcoming. Congrats to Danny and you for the big win on Saturday. At Hallett, I won on Saturday and sheared all the rivets on the center of the clutch disc on Sunday. Stuff happens on Sunday. What was the brake failure? I made a brain fart putting in the pads for the race and lost one warming up on the pace lap. Followed by the fluid. Followed by no brake pedal. Safer to pull off and give up. Been there. At least you had a fantastic race on Saturday. Pam, you are correct. I was misinformed as to the nature of the prep on that car. However other than the 10inch wheels and the brakes, the car he was driving is under prepped for an AS car. He would have to trade 1 inch of wheel, 14 inch brakes, and ABS but would gain the allowed camshaft (20-40rwhp), rear end ratio, and any suspension he choses. I'm pretty sure he would make that combo just as fast. Especially given the attitude that the current 12.2 in brakes and 17x8 wheels aren't a detriment to an FP AS cars performance. I know it. I had nothing to do with those changes AND, I wrote letters against it to everyone I could. IMHO, that car needed nothing, based on what it was given under my tenure (last year) and data from it that I reviewed last year. P. S. Other than write the letters, I could do nothing.